After a hurricane, things tend to be a bit chaotic. You’ve got so much to take care of, so much to do, and so many things you don’t know you need to do. 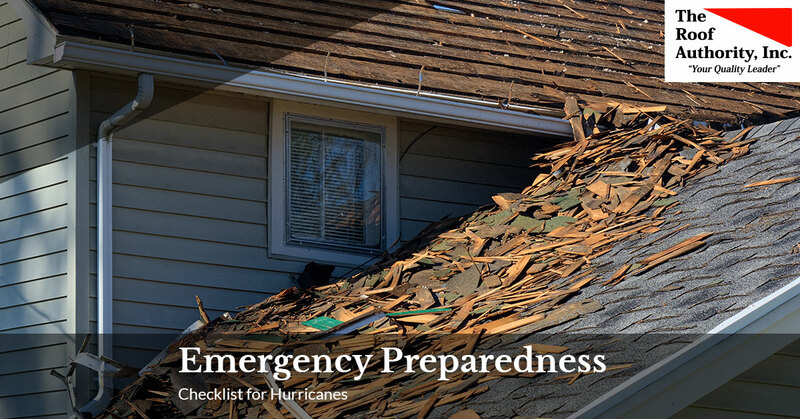 While few of us can truly prepare for everything, arm yourself to be better prepared for hurricanes by using this handy checklist. The Roof Authority has served the Fort Pierce and Vero Beach areas since 1993, and we are well-versed when it comes to the damage hurricanes can cause. When you need a trusted roofer with years of experience, who can handle wind damage restoration, roof replacement, and everything in between, contact us now! Now that your home is as prepared as possible, now it’s time to prepare yourself and your family. If you’re going to hunker down and stay in your home, you’ll want to be prepared with enough food and water ahead of time. Well ahead. The last thing you want is to have to brave crowds of frantic people who are vying for the last jug of water or loaf of bread! Keep these foods stored in a safe place that shouldn’t be affected by water damage, and make sure the others in your family understand that this food is just for emergencies. Make sure you have at least one gallon of water for each person and pet in your family to last a week. Stock up on water purification tablets, just in case. Canned and non-perishable foods, energy bars, packaged foods, and baby food/formula, if needed. Get enough for a week and plan for each person in the family. A small camping cooker is excellent for heating up food, purifying water, and making coffee. Special dietary needs should be taken into consideration as well. Even if people in your family don’t have regular medications or special needs, you should prepare a small medical kit. Here are some of the things you should keep on hand, just in case the damage in Fort Pierce prevents you from getting to a medical provider. A first aid kit will treat minor cuts, bumps, and scrapes. You can get a basic one, or one that has other supplies such as gauze, splints, and other tools. Pain relievers can alleviate headaches, minor injuries, and other pains. Medications for family members should be refilled well in advance, so you don’t have to worry about running out when all the pharmacies are closed down. Having these basic tools on hand will make a huge difference in how you’re able to function during and after the storm. Get a basic tool kit if you don’t already have one. Don’t bother with the cute kits with mini tools in them because those aren’t cut out for the scale you’ll need them for. Tarps and other ways to mitigate leaks could go a long way in keeping the damage down. You can nail them in place or tape them, depending on where they’re needed. Keep cash on hand just in case you need to purchase something when the power is down. Put together a plan of action with your family members, and make sure to reiterate the plan right before a storm starts. Make sure they know where to go when the storm strikes, and that everyone understands well in advance how to act, react, and get through the storm safely. If you’ve sustained damage after a hurricane, call the roofer you can trust: The Roof Authority. We are experts in storm and wind damage restoration, and will get the job done right the first time. Call now!